Antalya (pop. 600,000) is the modern name for ancient Attalia. The city was founded by Attalus II (159–138 B.C. ), the king of Pergamum, and was used by him as a Mediterranean port for his landlocked city. 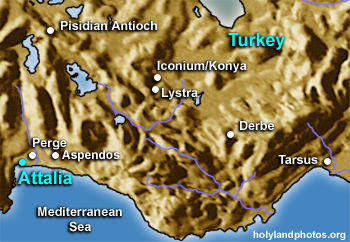 The road from Pergamum to Attalia ran through Laodicea. Attalia served as the capital of the Pamphylia, one of the few plains located along the southern Mediterranean coastline of Turkey.